Hi <>, What's Your Favourite Walking Place?! Hi <>, this month we encourage you to discover new walking places and share those with all of us. Discovering Great Walking Places In Your Area. Happy New Year to all you walkers! A new month, a new year, new beginnings. Let's celebrate with new walking discoveries! It's great to have a fresh start to help you keep striding along. Time to discover some interesting walking places in your area. For me, there's something magical about a walk around a lake. Is there a lakeside path where you live? If you live in the northern areas where there's snow and it's a bit chilly, get out and capture the beauty of the Winter Wonderland - fresh, crisp air, the stunning beauty, it can be very energizing! 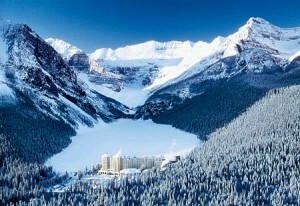 In the Rocky Mountains of Western Canada - Lake Louise is beautiful. We love walking there whenever we're back in Canada. When the lake is frozen it adds a special thrill. We love joining the many people from around the world walking there. They're always thrilled with the way the mountains surrounded this giant frozen shoreline path. Very beautiful and most energizing! If you live in an area where there's sunshine and rain, find a place you like to walk and really take in the glory of the outdoors. Take your time to really see what's in front of you. Revel in the moment. Your walk will take on new energy and a new meaning. I love walking around lakes, no matter when or where they are. Here in Cotacachi, Ecuador there's a lakeside hiking trail around beautiful Lago Cuicocha in an old volcano crater. Many people walk it. In this case (I recommend giving yourself at least five hours and maybe more. It's a bit challenging, but well worth it). Here's some really beautiful photos taken by Emma Migneault and Laura Schifman on a recent visit here from the US. 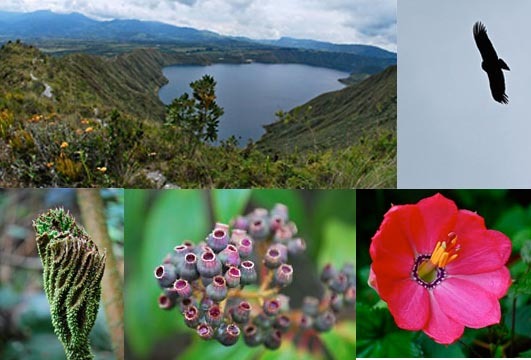 They spotted a condor and found some very interesting flowers and plants as they walked the trail. Thank you so much ladies. When you discover enchanted places to walk, it really motivates you to find other places to walk too. Change is good! Need A Little 'Discovery' Help? If you need a little help finding some of these special places, you might want to check out this nifty little website called Walk, Run, Jog. They have a gazillion trails from around the world. Just type your location into their Search field on the top left of the page. Isn't this a great way to start the year? Let's keep on trekking and make this a year full of fun and good health. Share Your Discoveries With Us! Send us your stories and pictures about your neat places. You can submit your stories and up to four pictures here. We will feature the best story and photos in an upcoming newsletter. Until next month … Happy Walking!